Now this is a Bluebird Workshop! The year 2004 in Florida, will be remember as the year of 4 direct hits from Hurricanes. Our central/southern area of Florida had three hurricanes directly go through our Bluebird breeding areas. Our Project has over 80 reporting Monitors of over 800 boxes, and all Trails were affected in some way. Months went by and we did not know what condition our Trails were in. Locally many Monitors had taken in their boxes, but many of their properties lost hundreds of trees. Hardest hit was the area of Arcadia and Ona, FL., where boxes just disappeared or were destroyed, but I have to say, the damage was not as bad as we first thought it would be. Avon Park, FL has a 100 box Trail at the Air Force Base, which was found to have 95 predator guards damaged. At the end of 2004 the prison welding classes will be rebuilding all new guards for that Trail. As of 2005 still no words from Tampa, FL and the two Trails of a total of 80 boxes. In Wildwood, FL the Monitor had trouble with boxes before the storm, but now says that about 25 of her boxes need replacing. Bluebird-L what was happening to us, but little did I know how bad the destruction was going to be in our areas. Judy Derry from NY always stayed in contact and sent postive e-mails to me. 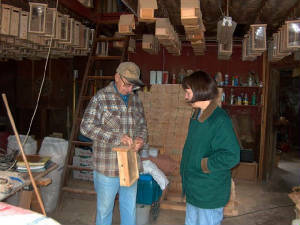 Much later came the e-mail where she told me that the New York State Bluebird Society would be donating boxes to help with what might have been lost in our area. 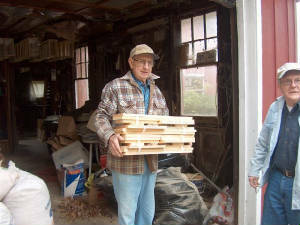 The 25 first boxes were delivered by Ron and Dot Howe, and our Ona Monitor, John Barrows met him to pick up the box kits. John was very excited to have the help because at that time he was sure nothing could be left of his Trail, which was in the direct path of the eye. The next boxes which made a total of about 6 dozen box kits where delivered by Marsha Smith and Piers Branham. Look at that car full of boxes!. 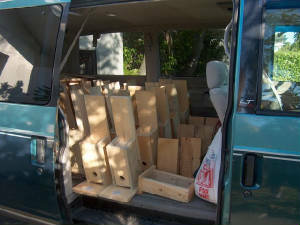 When they arrived in Florida they had time to put all the kits together, which is helping me greatly. As of now Ken Nauman, the Monitor of the Arcadia Trail, which was also in the direct path of the eye of the hurricane, has come and picked up 15 boxes. He really loved the new boxes, thinking they were really well made, and that having the boxes were going to help in replacing his Trail. The town of Arcadia was very badly destroyed. There are about 16 miles between the two Trails, and this is an area that needs Bluebird developing. We are hoping to try to connect the two Trails and making a Hurricane Memorial Trail. John's Trail extending more South, and Ken's going more North. I still plan on working on finding those in the Wachula, FL area where John lives of more people who actually lost their bird boxes. Most people, in the country, do not realize that there is still so much destruction and damage, that people are more concerned with getting their homes back to normal. It is going to take time to find those deserving, and ready again to be involved with birds. Tampa did report in, and came and took 15 boxe. Actually the New York Bluebird Society has gone beyond in meeting the needs of Bluebird Hurricane damage in our area. Gulf Breeze, FL where Phil had a three year established Bluebird Trail, it was totally wiped out. New York has also delivered boxes to Phil. Destruction was very bad in his home's immediate area. Phil's home will not be livable again for two years from this storm. The golf course where the Trail was is having to be totally repaired. 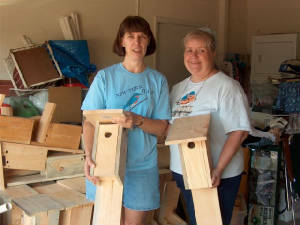 Herm Bressler of NY, has made thousands of these Bluebird boxes, which are just beautiful. I thought making a hundred in a year was something, but he makes them by the thousands! Wow! I hear he has helped many many people from his woodworking talents. Keep on going Herm! I can't say Thank You enough to the New York State Bluebird Society. Everytime I look at the boxes, I am so thankful that we received their help. The 2005 year is going to be right on track. All exsisting Monitors are pretty much going to be set for the beginning of the Bluebird breeding season. All donated boxes will eventually go out, but I want to make sure, because there were so many, that all boxes go where they are needed and going to help the most. Below is the e-mail I sent out on the Bluebird-L to start with the Thanks for helping. 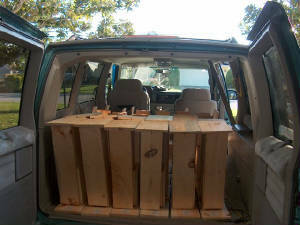 Side view of Boxes in Their Car -- That is a lot of Boxes! Marsha and Piers with Boxes in my Garage. Hi All, Wow! Great things have been happening down here in Florida. The New York State Bluebird Society has been working for weeks and weeks on a project to help us down here in Florida, but I did not know about it. Jerry Derry was always asking me questions of what had happening down here with our boxes because of the hurricanes. Then not so many weeks ago she said we would be having a visitor delivering some boxes. 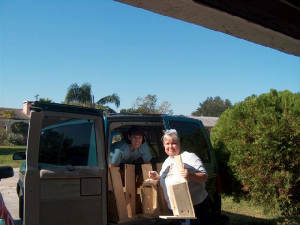 Ron and Dot Howe delivered to Winter Haven, FL 25 white pine box kits. Our Ona, FL monitor who lives in Bowling Green drove up to pick them up. John said he is very interested in the boxes and that they will help replace some of the boxes that were lost or damaged. We will also have boxes to put up in his general area. The people there have had so much damage, that we need to get the BBs around to bring happiness back to our area. Lots of natural habitat was also lost, and I fear many of the BBs. We did not have that much total damage of any of our boxes or Trail areas. John has already worked many hours at getting his boxes back in shape. Both John and I perked up a bit at the excitement of knowing boxes were coming. Until then it was pretty hard to get in the mood to work with BBs again with so much destruction still around, and people are still hurting. 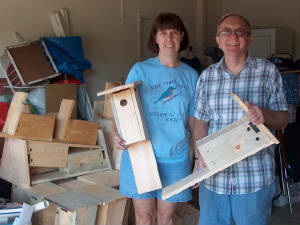 Then just a couple of weeks later Marsha Smith and Piers delivered another 44 fully made boxes and a bird feeder! Herman Bressler is the makers of these boxes. He has made thousands and thousands of these boxes which are all over NY, and now in Florida! They are just beautiful! Oh, it was a car load, and now a garage load of new boxes. It was so nice to have Piers and Marsha drive down from Clearwater to deliver them. Real Bluebirders! Photos at both deliveries were taken and will be displayed on both of our webs sites in the future. I also hope to get photos of the boxes when they are up. We now have boxes enough to help Ona, Bowling Green, Wauchula, Arcadia, Tampa, Wildwood a little here and there will help us all get back in shape. Since the deliveries I am getting in that Bluebird mood again. I was really really down in the dumps after the storms. Now I see a new year beginning it may be a bit slower, but then I had been running full speed. I have had two more new Monitors get trained and their boxes. Less than 3 months to the First Egg! The Myakka Livin' magazine article is due again and I will be letting them also know how the New York State Bluebird Society has helped our areas, and how they cared for us all down here. This is real Bluebirding working between the states, for the birds, and the people. Thank You so much for helping Christy's Bluebird Project get back up and going, helping our Bluebirds and especially myself... the NY Bluebird Society.... Your deserve a.... Big Bluebird Cheer!!!!!! !